So here I am blogging again and my report cards STILL aren't done, but I just had to share the some of the pirate things we have been working on. Oh and some of the AHH MAZING giveaways that are out there! First up we have been working on our pirate theme this week. One of my fabulous teaching team members found this hilarious book, Dirty Joe the Pirate A True Story. I also wanted to share some pictures of the pirate owl glyph we made today. I think they turned out SUPER cute! The kids loved making them! I love the eyelashes on this one! She wanted to make it a girl pirate. This kiddo wanted to add some facial hair to his pirate owl! Arggh I hate when I can't get the pictures to turn! But anywho I wanted to show you one with the pirate hat. I love all of the "tattoos" that this kiddo added to his pirate! And yes that is GLITTER you see on our pirates! One kiddo asked if we were going to make the hooks shiny, so of course I said YES and broke out the glitter. Then one thing led to another and there was glitter on eye patches, bandannas and hats! I also had to share a tip from one of my super smart teaching team members about doing glyphs. She asks the question and makes the kids stand in two groups before she shows them what they get for each answer. (I can't believe I didn't think of that before!) And it did keep everyone from saying yes I saw an owl so they could get the pirate hook! I did have one kiddo who tried to change his answer when he saw the hook, but I was tough and said sorry you only get to answer once. Now there are a few really great giveaways you will want to be sure to enter!! 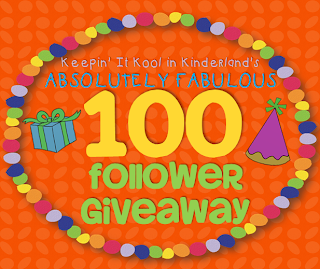 First my friend Khrys over at Keepin it Kool in Kinderland has reached 100 followers and her giveaway is huge!! Alot of bloggers teamed up to make a huge packet that a lucky someone will win. Click below to go to her blog and enter! 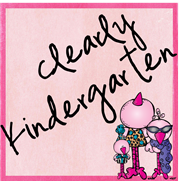 Then Shannon at Kindergarten Hoppenings is also having a just because giveaway! Aren't those great! She is giving away your choice of one of her products but enter fast it ends January 31st! Thanks for sticking with me through this really long post!!! Hope you have a great end to your week! I'd love to hear if you like the pirate owls (and feel free to pin) Thanks!!!! I love all things owls and I definitely love those adorable owl pirates! Pinning this so I can do it when I teach my pirate unit in May! Yay! Glad you can use them! At our school we are the owls so we also LOVE all things owl. You are sooo sweet! Thanks so much for the shout out!!! Just found your blog and we are loving those pirate owls!! :) I am sure your kiddos had lots of fun. The books sounds hysterical!! I can't believe your kiddos don't laugh about underwear, mine get so silly about it!! Cute blog, can't wait to read more. Thanks for stopping by! I know I can't believe my kiddos! Every other class I have ever had would be in hysterics! I love your pirate owls! My son loves pirates so this will be a fun project for us to do at home! He checked out Dirty Joe from his school library, and I thought it was such a funny book. I think I may have to do a pirate theme sometime in my classroom just so we can make your owls. Thank you so much for the templates! Yay glad you can use them! This is the first time I did a pirate theme and my kiddos LOVED it! The pirate owls are adorable, such a nice way to let the kids be creative and individual, nice job!